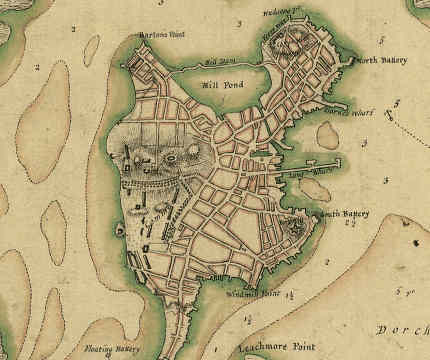 The map below shows Boston in 1775. Boston was originally a small peninsula encircled by the Atlantic Ocean, Charles River, Mystic River, and Chelsea Creek. Filling in the surrounding mud flats began in the early 1800s, and continued until the early 1900s. On the right side in the image below is Long Wharf. Land filling in the area began in the early 1820s during Mayor Quincy's administration, and continued until the early 1860s. In the 1700s, the ocean lapped to the shore almost up to the Old State House. Nearby Quincy Market is built upon the debris of old docks and discarded material. Mercantile Wharf became landlocked in the late 1850s or early 1860s. On the lower right is today's Seaport District, which was originally part of a then separate town of Dorchester. The area was a giant mud flat known as Commonwealth Flats (presumably due to state ownership) that was developed in about 1910 to create wharfs and warehouse space. Commonwealth Pier attained its name from the flats, and was eventually renamed the Boston World Trade Center. On the bottom is Boston Neck, and is where a gate and gallows stood, warning visitors to obey the Puritan laws of Boston. To the right of the Neck was South Cove, filled-in during the 1840s, which defined Fort Point Channel. On the left was another large mud flat known as Back Bay. A road was built across the cove in 1821, and was known as Mill Dam. The dam was constructed to minimize tidal flow, and to reduce the travel time to Brookline. Mill Dam or Cross Dam eventually became today's Beacon Street. Raw sewage used to flow into the resulting pond, and was a motivating factor to fill in the entire area. In the late 1850s, land filling Back Bay commenced, and created a lot of very expensive real estate. Many Brahmins from Beacon Hill moved to luxurious brown stone residences built in the new district. A hill in Needham was actually leveled to procure most of the fill material. Land filling Back Bay was completed in the 1880s. Of historical note, in 1775, the British departed by Sea (the cove in the Charles River) on the west side of Boston Common, and rowed over to Cambridge just before their march to Lexington & Concord. On the top is what was known as Mill Pond. The road across it was also called Mill Dam, and eventually became today's Causeway Street. The pond was filled in during the late 1820s, and the new territory was referred to as the Bullfinch Triangle because the streets were deliberately laid out in a unique grid originally proposed by architect Charles Bulfinch. Finally, the wrap of land around the northern most portion of the original peninsula of Boston was filled in during the early 1860s.